When there is a time will come for moving the wordpress site to new server or within your server. 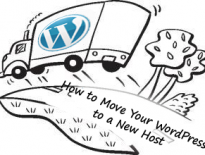 You have already know How to Move the wordpress site to New server. But if you move within or out side of your server requires some of down time for the maintenance of moving, if you want to move the wordpress blog to move with zero down time follow this. 1. Backup the database from the old site and import it to the new site. Careful on database names. 2. Change your wp-config.php in the old site to point to the database on the new site. Your old site will now run using database based on the new site and once you change the names servers new site will have the up to date database. 7. That’s all now now the wordpress runs on new server.